As thousands of workers and volunteers courageously mobilize to help victims recover from the catastrophic storm damage in Texas and Louisiana, OSHA advises workers and those helping in recovery efforts to take proper safety and health precautions to avoid injury. 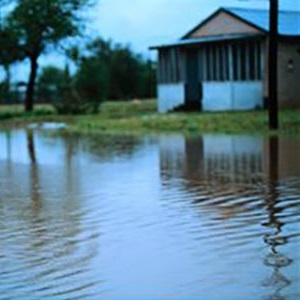 Following a natural disaster, recovery and cleanup workers can be exposed to many dangers, including downed power lines, carbon monoxide and electrical hazards from portable generators, confined spaces, fall and struck-by hazards from weakened and damaged trees, mold, high water levels, toxic chemical exposure, and more. OSHA has resources to help employers keep their workers safe when hurricanes and floods strike and during cleanup and recovery operations. 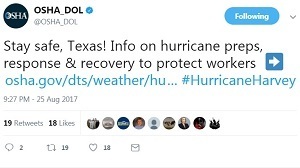 For more information visit OSHA.gov or the Department of Labor’s Hurricane Recovery Assistance webpage. Tennessee OSHA is co-sponsoring the sixth annual Safety Fest TN Sept. 11-15 in Knoxville and Oak Ridge. The event offers free safety and health training classes to employers and workers on topics including electrical hazards, ergonomics, fall prevention, and ladder safety. OSHA 10-hour certificate courses also will be available. For more information and to register, visit the event website. The Arkansas Amputation Prevention Stand-Down, Sept. 14-30, invites employers and workers to pause during their workday and focus on best practices to avoid amputation hazards. The stand-down, now in its third year, aims to raise awareness about preventing debilitating amputation injuries. A free, public kick-off event will be held Sept. 13 in Little Rock. A website is available for employers and workers to sign up for the stand-down, access posters and other resources, record their data, and print a certificate of participation. AgriSafe Network, a Susan Harwood Training Grant awardee, is sponsoring several free daily webinars in recognition of National Farm Safety and Health Week, Sept. 17-23. Topics include reducing heat illness; respiratory protection, strategies to reduce respiratory exposures, and illnesses; and ATV safety. Visit the AgriSafe Network website to register. OSHA’s Compliance Assistance Specialists help employers comply with OSHA requirements and prevent workplace injuries and illnesses. Specialists and staff from OSHA field offices conducted more than 1,300 outreach activities between April and June, reaching more than 700,000 people. Following are a few examples of OSHA’s outreach efforts. Participated in events across the country to support the 2017 National Safety Stand-Down to Prevent Falls in Construction. Delivered presentations at the Clarion University Small Business Development Center in Pennsylvania, and the Oshkosh Safety Council in Wisconsin, on how OSHA’s On-Site Consultation Program can help small businesses. Provided workplace safety and health information to high school students and young workers around the country, including presentations in Texas during an OSHA 10-hour construction course and in Oklahoma during a SkillsUSA competition. Held a heat stand-down for mail carriers and clerks in South Carolina, and a seminar on OSHA’s heat illness prevention campaign for workers from a variety of industries in Oklahoma. Provided outreach to cleaning crews, roofers, and other responders after tornadoes in Texas, Missouri, and Oklahoma. OSHA and Skanska Walsh JV recently formed a strategic partnership with the goal of reducing hazards and enhancing workplace safety and health for 1,600 employees working on a redevelopment project at LaGuardia Airport’s Central Terminal in New York. The agency will assist with safety and health training, conduct inspections, provide technical assistance, and recommend improvements to the partnership’s goals. OSHA’s partnership with Skanska, a global construction services group, is a collaborative effort between federal officials, private sector companies and labor organizations to provide training, hazard prevention and monitoring of workplace safety concerns during the renovation. For more information, read the news release. The David L. Carrasco Job Corps Center renewed a three-year agreement to inform young workers about safety and health hazards on the job, including falls, electrocution, struck-by, caught-in or caught-between, and heat illness. The alliance provided training on personal protective equipment in the construction industry to more than 500 people. The El Paso Community College – Risk Management Institute signed a two-year agreement to prevent worker exposure to hazards, including falls, electrocution, struck-by, and caught-in or caught-between. The Grain Elevator and Processing Society – Great Plains Chapter signed a two-year agreement to increase awareness and prevent grain engulfment and entrapment. The U.S. Forest Service – Northern Region and National Federation of Federal Employees – Northern Region signed a two-year agreement to focus on safety and health issues unique to the region, including facility and field hazards. The Western Colorado Contractors Association signed a two-year agreement to help protect the health and safety of construction workers, particularly preventing exposure to fall and trenching/excavation hazards, and work zone safety. Arnold Center Inc., a vocational rehabilitation services company in Michigan, contacted the state's On-site Consultation Program to help reduce its injury rates and workers’ compensation costs. During their visit, consultants identified areas for improvement, several of which could be made at little or no expense. After making these improvements and continuing to work with Michigan OSHA, the Center significantly reduced worker injuries and saved approximately $30,000 per year in workers compensation premiums. The company’s safety and health program became one of the best in its district, eventually earning acceptance into MIOSHA’s Safety and Health Achievement Recognition Program. For more information, read Arnold Center’s success story. Carthage Specialty Paperboard Inc. was cited for 61 violations after exposing workers to serious hazards at its New York mill. OSHA inspectors responded to a complaint alleging unsafe working conditions and discovered more than 20 instances of machinery lacking safety guards to prevent the risk of amputation. Machinery in the mill did not have safety locks to prevent accidental start-up, employees were not trained or provided Personal Protective Equipment (PPE) to work on electrical systems, metal catwalks did not have fall restraints, and employees entered confined spaces without prior atmospheric testing. The company was proposed fines totaling $357,445. Read the news release for more information. OSHA cited First Dakota Enterprises Inc. for failing to protect its workers from trench collapse hazards. A 34-year-old worker was completely buried when the walls of a 14-foot trench collapsed around him. Co-workers quickly uncovered the victim’s head, which allowed him to breathe while emergency personnel worked for more than 30 minutes to free him. Inspectors determined that the company failed to use a trench protective system or conduct regular site inspections to correct potentially hazardous conditions. Proposed penalties are $95,064. For more information, see the news release. Felker Brothers Corp. faces $110,458 in proposed penalties after OSHA inspectors responded to a complaint and found 13 serious safety and health violations at the steel pipe manufacturer’s facility in Marshfield, Wis. A grinder operator was exposed to excessive levels of hexavalent chromium, which can cause serious cause respiratory tract, skin, and eye irritation. Another worker was hospitalized after suffering a shattered jaw and concussion after being struck by a piece of machinery. OSHA also found the company used damaged cranes; altered forklifts without manufacturer’s approval; failed to inspect jacks, and allowed combustible materials to be stored within 35 feet of welding and hot work. For more information, read the news release. Minnesota OSHA issued three citations and $184,100 in penalties to Visu-Sewer Inc., in Saint Paul for safety violations when a worker was fatally injured after becoming entangled in sewer lining equipment. Inspectors determined that the company failed to train workers in the recognition and avoidance of unsafe conditions, did not equip a hydraulic roller to cut off power, and allowed workers to use equipment modified from the manufacturer’s specifications for safe operation. Wyoming OSHA issued five citations and proposed $53,716 in penalties to Reiman Corporation in Cheyenne for exposing workers to fall hazards. Inspectors observed one worker standing on the forks of a forklift and another on a steep roof without fall prevention systems, such as guardrails, safety nets, or personal fall arrest equipment. Reiman Corporation was previously cited for these violations in 2014 and 2015. The company also failed to adequately train and certify each forklift operator as required. OSHA has released a new guidance document to help employers at oil refineries comply with the agency's Process Safety Management standard. PSM is critically important to facilities that store highly hazardous chemicals. Implementing the required safety programs helps prevent fires, explosions and large chemical spills. Process Safety Management for Petroleum Refineries reviews common instances of non-compliance with OSHA’s PSM standard in the petroleum refinery industry. A new addition to OSHA's Fatal Facts series emphasizes the importance of using manufacturer-approved lifting equipment to prevent falls. 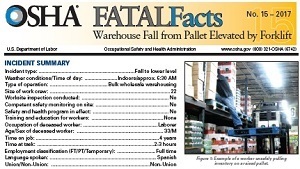 Warehouse Fall from a Pallet Lifted by a Forklift, examines the root causes of an incident in which a worker died in a fall from an improperly raised pallet while pulling stock from elevated shelves. Fatal Facts describe cases in which there was a failure to identify and correct hazardous working conditions before they resulted in fatalities at the worksite. The National Institute for Occupational Safety and Health will host a webinar Sept. 28 from 1:00 to 2:30 p.m. ET on best practices for addressing occupational safety and health challenges posed by an aging workforce. The webinar will feature presentations on: research to address age differences at work; coaching to help workers manage and reduce the strain that chronic illness may present; and translating scientific knowledge on aging and its societal implications into policy-focused practice. For more information and to register, visit NIOSH's website. This webinar is the second annual installment of the Total Worker Health: Productive Aging and Work series. The first webinar, “Theory, Health Data, and Practical Solutions,” examined the concept of productive aging, designing aging-friendly workplaces, and hands-on methods organizations can take to meet workplace safety and health needs of workers of all ages. Through its alliance with OSHA, the Society for Chemical Hazard Communication (HazCom) developed a training presentation to help school staff identify chemical hazards in their workplaces and employers comply with OSHA’s Hazard Communications standard. The presentation includes PowerPoint slides, script and follow-up quiz. The standard applies to schools where staff use cleaning supplies or where faculty handle and store chemicals in laboratories. 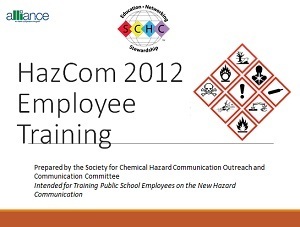 The SCHC also offers a library of HazCom 2012 Information Sheets.